The world’s largest manufacturer, supplier, and installer of raised access floor solutions – has launched a new range of architectural floor finishes at London Build 2018. StoneWorks, WoodCraft and Resilient will deliver greater flexibility when designing first-class commercial spaces. Integrated finishes, comprising a solid concrete core fused to a steel sheet with an edge band, which provide a rugged range of decorative concrete finished floor surfaces with all of the advantages of raised access flooring. Bonded floor finishes which combine the outstanding visual appeal of natural wood and stone surfaces with the performance benefits of an access floor panel. The selected surface finish is bonded to the high-density particle board core and sits within a galvanised-steel tray. Overlay tile finishes which is an innovative modular dry-install system that encompasses a ceramic tile fixed to a steel sheet with an injection moulded plastic connector frame and rubber joining strips. This has been developed specifically for challenging, high-traffic commercial environments, such as airports, offices and retail stores. Attiro – an overlay engineered timber solution– includes magnetised staves which provide the look and feel of a traditional wooden floor, whilst allowing access to the void. 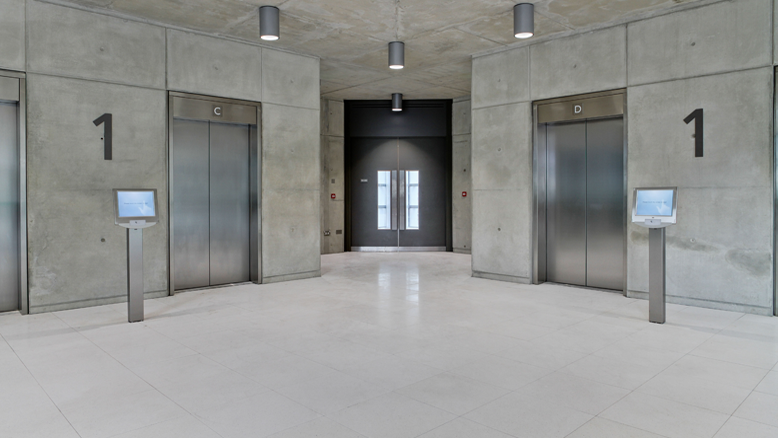 Kingspan Access Floors provides effective and efficient systems for swift access to sub-floor service voids in commercial, education and data centre buildings. The access flooring systems are practical applications by design, but the high-quality aesthetic finishes ensure architectural intent is never compromised. This makes them the perfect choice for prestigious developments.